Summary: Why is wood heating such a good idea? Heating with wood is one of the most popular and best ways to heat and cook independently from the systems of the world. Why? Because one can grow his own fuel—trees. A person cannot readily grow electricity, natural gas, propane gas, or fuel oil. God in His infinite wisdom and love has provided excellent species of wood in most places of this country. In the following chart is a list of species and their corresponding possible recoverable heat units in millions of BTUs. This info is provided by the University of Minnesota and the University of Idaho. As you can see, hickory is the best on the list for giving off the most heat while White Cedar gives off the least number of BTUs. 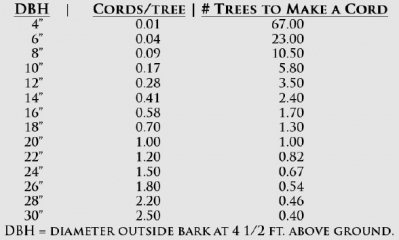 The following table was prepared by the University of Idaho Extension Service and can help when estimating how many cords of wood are present on land that you are interested in. Make sure your firewood is well seasoned before burning in your wood stove. Why? Creosote is a residue that collects on the inside of stove pipes or flue liner when wood that has not been dried has been burned in the stove. 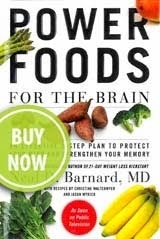 In theory, it is similar to the build up of plaque in human arteries. This collection of creosote restricts the flow of smoke and gases through the stove pipe and could ultimately result in a chimney fire—which can be very dangerous. To help prevent this from happening, firewood needs to be cut and air dried for approximately one year before being burned (depending on the climate of your region and species of wood). Also, the stove pipe needs to be cleaned/brushed out regularly. • If the wood cutter of the house had an injury that would prohibit the cutting of firewood, that person might be out of commission for a year or two. There would then be a reserve of firewood to fall back on. • The time is coming when it will be difficult and finally impossible for those who obey all God’s commandments to buy or sell. I’d much rather cut wood during a time when I can buy gas/oil and parts for my chain saw(s) than when I can’t. Don’t forget to rotate your stock of firewood by burning the wood that has been drying the longest. Firewood loses valuable BTUs while it is stacked for many years, waiting to be burned. If you calculate that you barely have enough trees (or maybe fewer than needed) to maintain a renewable supply of firewood, it might be wise to harvest your yearly firewood supply from some other sources until the time comes that you won’t be able to buy or sell. These other sources may include the National or State Forest in your area. Also, there may be a lumber mill in your area and frequently they will have rejected logs that cannot be used in milling lumber. 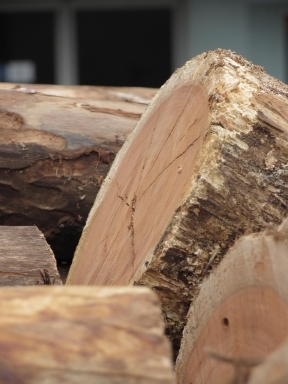 They often sell these logs at a discount and they may be cut into firewood. This article from the staff at Mountain Media Ministries can be found in the MMM Newsletter issue 3. 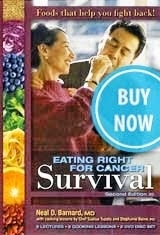 Learn more valuable information from Mountain Media's DVDs, available through the Amazing Discoveries™ webstore. i. Storey Country Wisdom Bulletin, Woodlot Management: 3.